Who'd have thought that the 'man in black' was such a fan of the white fluffy stuff. Beyond his rebellious streak there was certainly a homely sort that craved the glow of a family Christmas and his deep baritone voice proved to be perfect vehicle for the songs of the season. Cash recorded 4 Christmas album's over 4 decades and each had its own identity. He also hosted 2 TV Christmas specials in 1975 and 1976 which were filmed at his home in Tennessee and featured his wife June and assorted other family members. It may have been his first Christmas album but in 1963 Johnny Cash was a major star with 16 albums to his name already. 'The Christmas Spirit' contained a number of traditional tunes like 'Silent Night', Blue Christmas' and 'Little Drummer Boy' but Cash also wrote 4 original songs for the occasion ('The Christmas Spirit', 'The Gifts They Gave', 'We Are the Shepherds' and 'Who Kept the Sheep'). And with his wife June Carter chipping in with 2 others 'The Christmas Spirit' certainly felt like something fresh and new. With his wife June Carter (and member of her family) and his brother Tommy Cash involved this 1972 festive piece certainly lived up to its billing. And the between song narration certainly gave the album a more personal feel. Again Cash and Carter were on hand to write several original songs with Tommy adding his own with 'That Christmassy Feeling'. This was the first Christmas album from Johnny Cash not to feature original tunes from the country star. Among the traditional standards that got the Cash treatment were 'O Little Town of Bethlehem', 'Away In A Manger' and the little known 'The Christmas Guest'. 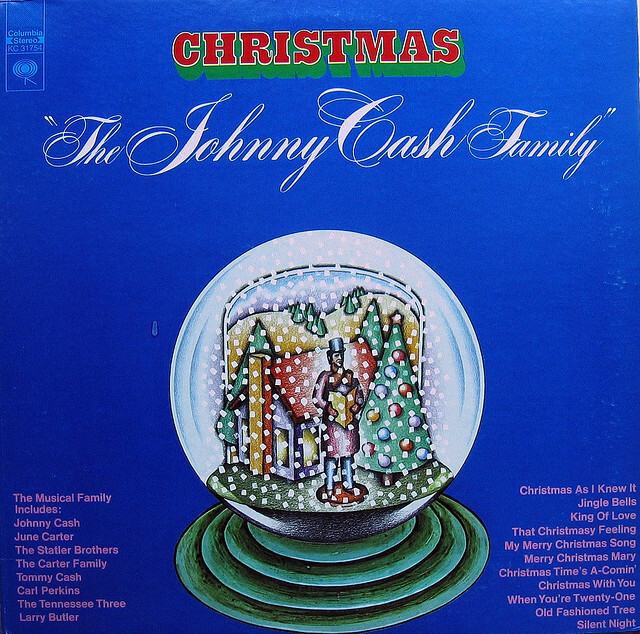 Johnny Cash was again joined on this Christmas album by his wife June and her family for a run through 13 standards. Although 'Johnny Cash Country Christmas' did not include any originals like his earlier efforts it still shone a new light on the classics thanks to Cash's unique style. Johnny Cash’s first Christmas offering is an interesting mix of classics and originals. The superstar delivers crooning renditions of traditional carols like Silent Night and I Heard the Bells on Christmas Day, along with unique take on The Little Drummer Boy. Cash’s original songs however give this album a pensive and slightly dark edge. Backed by an angelic sounding chorus, Cash uses these new tracks to deliver a sermon of sorts about the holiday and its religious significance. Christmas as I Knew It gives listeners a glimpse into Cash’s childhood celebrations, whilst Ringing the Bells for Jim is a depressing yet beautiful carol about death. 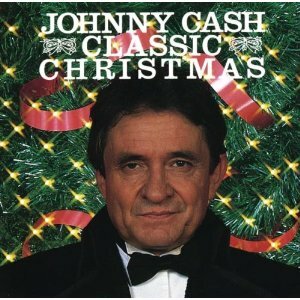 Christmas Spirit is not the most uplifting of holiday albums, but fans of Johnny Cash are sure to expect nothing less. Johnny Cash enlists the help of his family and friends for this, his second holiday collection. Cash revisits Silent Night and Christmas as I Knew It from his first yuletide album, bringing along his wife June Carter Cash to help out with the latter. Unlike Christmas Spirit, this album features less of the soulful Cash originals, but his thought-provoking narrations are still here in droves; this time interspersed between almost every song. Other performers on the album include Cash’s brother Tommy, his songstress sister-in-law Anita Carter and songwriter Carl Perkins. 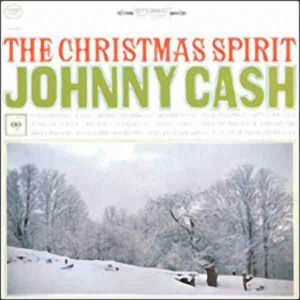 As the title suggests, Cash’s third Christmas album consists purely of traditional songs. Cash brings his inimitable style to classics such as Joy to the World and O Little Town of Bethlehem, whilst yet again reprising Silent Night. 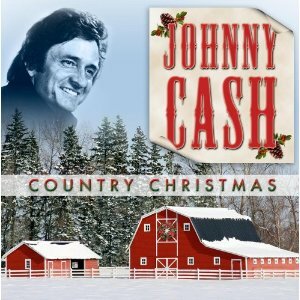 The absence of any originals however makes this album the least memorable of Cash’s four Christmas collections. On his final Christmas album, Johnny Cash is flanked by an entirely female chorus. This, along with the excessively corny backing music, makes this a rather twee addition to Cash’s output. Whilst the chorus serves to give the tracks a traditional feel, one can’t help but wonder if the whole thing might have been better off without them. Oddly enough, there are several songs on the album completely devoid of Cash’s vocal leads, making for a strange and slightly lopsided collaboration.